On Saturday, June 25th from 6pm – 11pm, Rum Runners will take place at Memminger Auditorium in the heart of downtown Charleston. This event invites cocktail & food lovers alike to enjoy exploring the spirits and flavors of the West Indies with 10 chefs and 30 rum distilleries serving up delicious pairings. The fun doesn’t stop with cocktails & food as patrons will be treated to Caribbean inspired music and games. Proceeds from the event benefit the Cancer Survivor Programs of Dragon Boat Charleston. The event will feature cocktails from dozens of rum distilleries from across the globe including Pusser’s, Mount Gay, Bacardi, Plantation, Papa’s Pilar, Zacapa, Naked Turtle, Captain Morgan, Kraken, Rum Haven, Sailor Jerry, Flor de Cana, Don Q, Appleton, Baron Samedi, Ron Anejo Pampero, Myers’s, and more. The event will also showcase the emerging local rum industry with Firefly Sea Island Rum, Red Harbor Rum, Daufuskie Island Rum, Muddy River and Striped Pig. Additionally, the taste of the West Indies will inspire Charleston’s top chefs who present Caribbean and exotic flavors. Participating restaurants include Cane Rhum Bar, Victor Social Club, Charleston Caribbean Creole, The Americano, The Cocktail Club, Cherrywood, Southerly at Southern Season, Pacha Mama, and Caribbean Delight. Chefs will select a favorite rum to create one-of-a-kind pairings with their dishes that will excite foodies & cocktail lovers alike. “This is a great chance to try innovative new rum cocktails you’ve never experienced before and see how the local rums compare to the world’s oldest brands,” said Rum Runners producer & creator Rebecca Gosnell . There are two ticket options for Rum Runners, both of which are all-inclusive providing guests with unlimited sampling from all participating distilleries & restaurants. The VIP Preview ticket is $95 and allows guests advance entry into the event from 6pm – 7:30pm. A limited number of tickets are available during this time affording guests a more exclusive chance to interact with distilleries & chefs before the doors open for general admission guests. General admission tickets are $75 each and doors open for this ticket at 7:30pm. All guests must be 21+ with valid ID. For more information about the inaugural Rum Runners and to purchase tickets, visit www.RumRunnersCharleston.com. Charleston Culinary Tours has added a Distillery Tour featuring Charleston Distilling Company, High Wire Distilling Company and Striped Pig Distillery on Thursdays, Fridays and Saturdays from 12:30 p.m. – 4:00 p.m starting at the Charleston Visitors Center Bus Shed and concluding near there. As its sixth tour available, this 3.5 hour tour of Charleston’s micro distilleries has guests riding in style in Charleston Brews Cruise’s air conditioned coach for a 3 stop tasting tour, learning more about Charleston’s growing craft distillery scene. 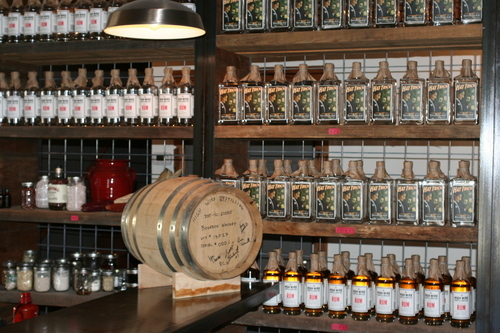 In addition to samples at each distillery and snacks and water between stops, at the conclusion of the tour participants will be taken to a local pub to enjoy a cocktail made with one of the spirits distilled locally in Charleston. Charleston Culinary Tours combine the best of Charleston history, cocktails and food with unique historic tours that highlight the local cuisine and drinks. Held rain or shine, there are now six tours that include Historic Downtown, Upper King Street, Chef Showcase at The Farmer’s Market, Mixology, Distillery & Chefs’ Kichen tours. The food and drinks on the tours are chosen by various restaurant, bar and distillery partners and feature an array of eclectic dishes and concoctions that provide insight into Charleston’s cuisine and cocktail scene. On each tour, you will not only have an opportunity to sample some of the Lowcountry’s finest offerings, but also to meet the owners, chefs, distillers and mixologists behind Charleston’s impressive culinary and bar innovations.